Drake, Nicki Minaj, Bruno Mars and more shared emotional messages following the tragic incident. 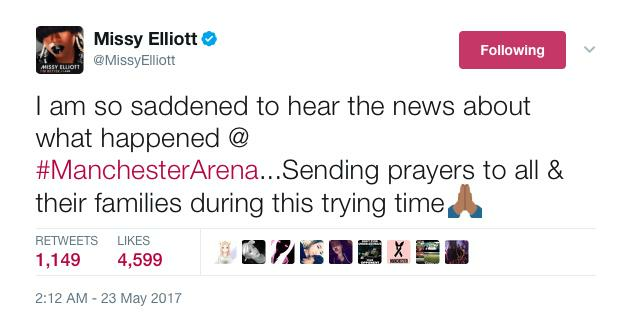 Hip-Hop and R&B stars have shared messages of support following the Manchester Arena explosion. 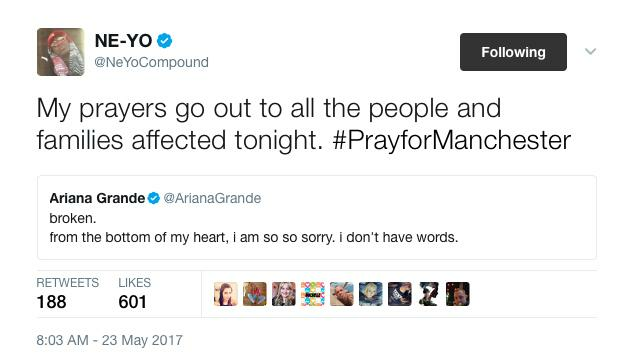 The bombing occurred at the end of an Ariana Grande concert last night (22nd May), resulting in 22 deaths, including children, and 59 other casualties. Musicians from all over the world took to social media to provide support for Ariana, her team and the victims of the tragic event. We just left from touring in Europe and this was such a real fear we discussed frequently. I was crushed today to hear it became a reality. My condolences to all of the families affected and we will be praying for all of Manchester. Also I am praying on peace of mind for Ariana. Currently being on tour and understanding how much concerts are safe spaces for support, love, peace & expression... this breaks my heart. My heart is with the victims, their families, everyone who had to experience such a traumatic encounter, and with the entire Ariana tour team. Prayers for Manchester & that team tonight, be safe and again, everyone's heart is with you. In related news, Ariana has reportedly suspended the remainder of her world tour in the wake of the attack.